Maintaining your lawns well-cut is necessary for every home and business owner who would like to keep the overall look of their property’s external parts the way it should be. Our company can take a great care of your garden and lawn and providing it with excellent grass cutting services that come at affordable prices. Our gardeners have passed through special training in order to be able to cope with all eventual challenges that could be posed to them. 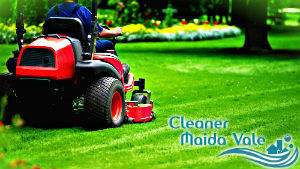 They are well aware of the fact how important it is for our customers in Maida Vale to have well-maintained yards and gardens and will do their best in order to give them that. If you choose our grass cutting services, you are guaranteed to have the plants perfectly cared for. No matter if it comes to a residential or a commercial property lawns, our employees will have your grass cut on a regular basis in order to keep its looks the way it is supposed to be. In addition, our team will make a preliminary inspection of the overall condition of your garden in order to provide it not only with the best, but with the most appropriate care. Our gardeners are equipped with modern equipment and powerful lawn mowers in order to do the job quickly and efficiently. Additional gardening services are also available on our customers’ request. Apart from cutting the grass efficiently, we will also carry out various other services, such as moss and weeds removal, soil fertilizing, aerating and overall garden clearance. If you have any specific requirement, you can feel free to share your needs with us. Call and book us in W9 – we are just a phone call away! Choose us and get perfection in every single detail!